The ovaries are small, paired female reproductive glands that serve as the main source of the hormones estrogen and progesterone. 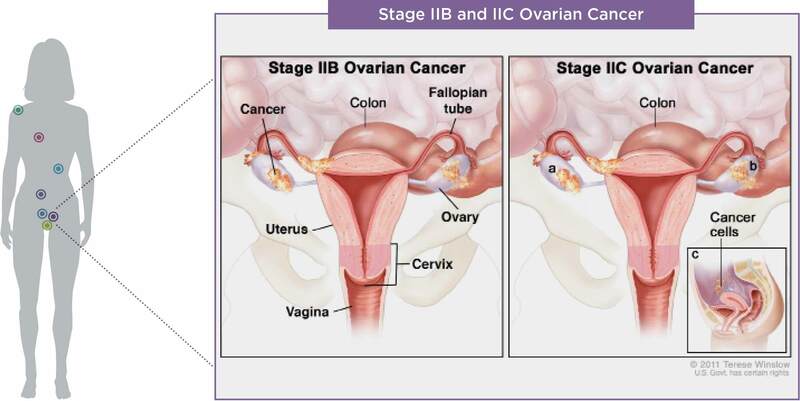 Ovarian cancer is cancer that begins in the ovaries and may arise from 3 main kinds of cells: epithelial cells (cells that cover the ovaries), germ cells (cells that produce the eggs) and stromal cells (cells that form the supporting or structural tissue holding the ovaries together). Ovarian carcinomas are the most common ovarian cancers, accounting for about 85% to 90% of all ovarian cancers. Subtypes include serous, mucinous, endometrioid, clear cell and undifferentiated. The main focus of this document is epithelial ovarian carcinomas. Ovarian cancer often goes undetected. Often the cancer is found after it has spread within the pelvis and abdomen. As a result the cancer is difficult to treat. Poor appetite; weight loss; abdominal pain or vague discomfort above navel; sense of fullness in upper abdomen after eating a small meal; heartburn or indigestion; nausea; vomiting (+/- blood); swelling or fluid build-up in abdomen. There are no screening testrecommendations for ovarian cancer at this time. Transvaginal ultrasonography and CA–125 testing may be suggested when appropriate. Early-advanced stage cancer Surgery to remove the tumor is the primary treatment. The grade of the cancer, which determines aggressiveness, may suggest watchful surveillance or treatment with chemotherapy after surgery. Advanced stage cancer Surgery for staging and debulking the cancer is generally indicated. This includes removal of the uterus along with the fallopian tubes and ovaries (total abdominal hysterectomy with bilateral salpingo-oophorectomy). In addition, the omentum, fluid in the pelvis or abdominal cavity, and lymph nodes in the pelvis and abdomen are removed and analyzed. Chemotherapy is recommended for at least 6 cycles. Metastatic stage cancer Treatment options include surgery and combination chemotherapy, which involve more than one medication at a time. Different options of administrating chemotherapy, such as intraperitoneal chemotherapy, may be suggested. Patients who are too weak to have full staging and debulking surgery are sometimes treated with chemotherapy as the first treatment. Clinical trials for combination chemotherapy, biologic therapy and/or targeted therapy may be considerations. American Society of Clinical Oncology: Ovarian Cancer (http://www.